2 Bedroom Detached Bungalow For Sale in Northallerton for Guide Price £230,000. 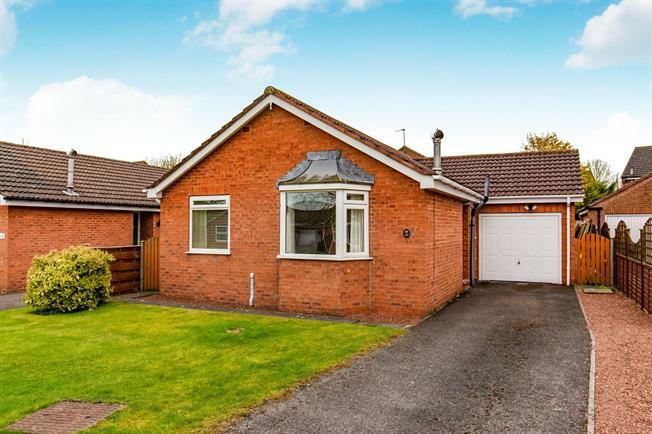 Benefitting from front and rear gardens, a driveway and garage, this well presented two bedroom detached bungalow must be viewed to be fully appreciated. Offered for sale with NO CHAIN. We highly recommend viewing at your earliest convenience to avoid disappointment. Briefly comprising of; Entrance hall, kitchen, living room, two bedrooms, bathroom and garage to the side, and gardens to the front, and rear. The lounge is light and spacious with dual aspect bay windows, a gas fire and is fully carpeted. The kitchen has a good range of wall and base units, and a standard one and a half bowl sink. Light and spacious, with a uPVC double glazed window overlooking the rear garden. The master bedroom has patio doors leading to the rear garden. The bathroom comprises, a panelled bath with shower over, standard flush toilet, and wash basin. Attached single garage with up and over door.